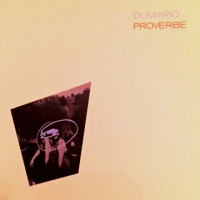 DUMItRIO's debut album Future Nostalgia (Self-produced, 2014) combined elements of jazz, rock, classical, electronic and Eastern European music. Proverbe, while still rooted in diverse influences, is more focused and holds together in its consistency. This new collection generates a captivating atmosphere, informed by Romanian folk music and buttressed by the readings of native proverbs and unstructured improvisations. The versatility of the musicians adds to the subtle variety of moods, making each piece a fresh start. George Dumitriu leads the trio and is a Romanian guitarist, violist and violinist now living in Amsterdam. A winner of several international prizes he has worked with Benny Golson, Ambrose Akinmusire, Michael Moore and many others. Mattia Magatelli has played bass in twenty countries and most notably with the Kaja Draksler Acropolis Quintet. Slovenia native Kristijan Krajnčan has been playing classical cello since the age of five and drums from ten. He is featured on more than two-dozen recordings and has performed in as many countries. He has composed scores for three features and nine short films. "Proverb 4" opens with the emphasis on classical strings, but the piece is hardly in that genre. The overall vibe is closer to a beat generation reading (in Romanian) with accompanying music. Each of the four inter-dispersed "Proverb..." iterations has a distinct musical style surrounding the readings. In the case of "Proverb 1" there is a hip-hop element; "Proverb 2," a jazz-rock fusion, and "Proverb 3" an avant-garde classicism. Far removed these fringe arrangements is "Ceva" where guitar and strings present a melancholy ballad and "Approval," a straight-ahead jazz guitar composition. The European distributor ToonDist typically provides little information regarding releases from the many small labels it sends our way. Similarly, the labels themselves are not preoccupied with liner notes, and online research sheds only peripheral enlightenment as these groups that tend to be relatively new. That's a bit of a disadvantage to listeners, especially in the case of groups like DUMItRIO, where each member of the trio plays multiple instruments, sometimes in the same musical family, making it difficult to know who is contributing what. It is, however, not a detraction from the music on Proverbe. The album is unique on multiple levels and certainly out of the mainstream of western listeners. DUMItRIO has a complex program to offer, even if in a plain brown wrapper and it benefits from several plays. Track Listing: Proverb 4; Ceva; Proverb 1; Approval; Haz; Proverb 2; Momentum; De 7; Proverb 3. Personnel: Mattia Magatelli: contrabass, electric bass; George Dumitriu: guitar, violin, viola; Kristijan Krajnčan: drums, cello.